Every year, Jeep and Mopar unveil a collection of concept vehicles at the Easter Jeep Safari in Moab, Utah. The offroad community and media anxious await the reveal of these vehicles, with some years showcasing more exciting vehicles than others. After last year's uninspired offerings (so bland that I didn't even bother to cover the story) the team at FCA really upped the ante for 2015 - the best collection since 2012. You can find my coverage of the concepts for 2013, and 2012 by following the links. 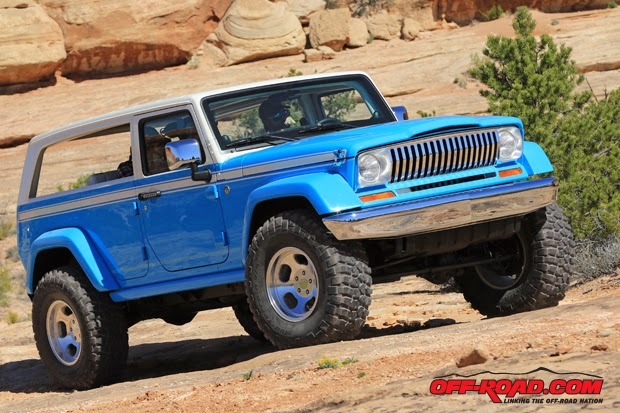 Jeep loves retro, and this year's Jeep Chief modernizes their 1970's heritage. Built on a 4-door Jeep Wrangler Unlimited platform, the Chief is a reinterpretation of the classic Cherokee Chief with a focus on the laid-back Hawaiian beach vibe. Off-Road.com, Jalopnik, and Car and Driver published their own reviews of the Chief, and judging by the world's response, Jeep has created a real hit. Even more retro is the Jeep Staff Car, which pays homage to the original World War 2 Willys Jeeps. The open-air top, minimalist interior, blackout lights, tools, and NDT military tires all show the modern-day Jeep's direct link to its military ancestors. Off-Road.com and Car and Driver gave it a very favorable review. The Jeep Wrangler Red Rock Responder is clearly inspired by Discount Tire Direct's famous RESQ1 backcountry support vehicle. The extended wheelbase and service bed carry tools and parts for remote vehicular rescue. 37-inch tires make up for the long wheelbase's breakover angle, while Dana 60 axles provide an appreciable increase in strength to stand up to the weight and leverage. My favorite of the bunch, however, is the Jeep Wrangler Africa. The closest to production of all the concepts, the Africa expands on the Wrangler's capabilities by pushing it into a niche occupied in other parts of the world by the Land Rover Defender 110/130 and 70-series Toyota Land Cruiser. With a 12-inch stretch to the body, a raised roof, and a fixed hardtop, the Africa is the perfect expedition vehicle. A 2.8-liter turbodiesel engine is the icing on the cake. Off-Road.com and Jalopnik give it rave reviews. Jeep produced three other concept vehicles based on the Grand Cherokee, the Renegade, and the Cherokee. These were all upfitted stock vehicles rather than true "concept vehicles" and are outside the scope of this Wrangler-centric blog. You can read about these and the above-pictured Jeeps at Expedition Portal, Autoblog, Four Wheeler, and Off-Road.com. Four Wheeler put together an awesome photo gallery of all the vehicles. For more information on the Mopar Performance Parts exhibited on these vehicles, visit Off-Road.com's article. "Jeep is proud to be taking seven new eye-catching and extremely capable vehicles to the Easter Jeep Safari, where we expect to delight our most loyal enthusiasts," said Mike Manley, President and CEO – Jeep Brand. "We go to this legendary event each year to showcase our latest Jeep production vehicles, as well as a variety of new ideas in our concept vehicles. In doing so, we receive a tremendous amount of valuable feedback, while interacting with our customers in the Jeep brand's natural environment. We're especially looking forward to this year's Jeep Safari, as Renegade makes its official public debut on Moab's demanding trails." This year's collection of Easter Jeep Safari concept vehicles were designed with a combination of production and prototype Jeep Performance Parts. Mopar designed, engineered, built and quality-tested the Jeep Performance Parts (JPP) line meeting strict Jeep specifications, with 4x4 capability and craftsmanship so owners can transform their stock rides into even more capable trail performers. 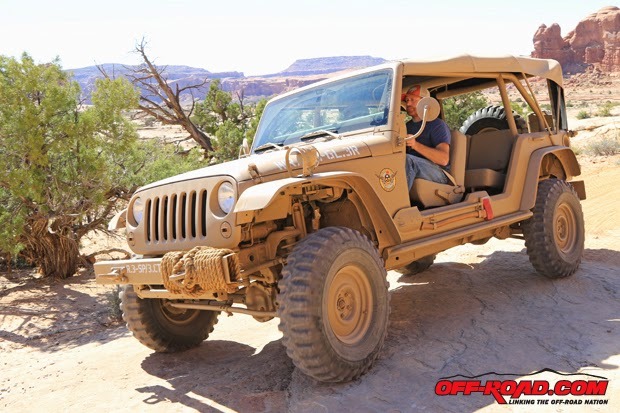 "The most enthusiastic off-roaders travel to Moab each year for this premier event, making Easter Jeep Safari the perfect place to showcase Jeep Performance Parts," said Pietro Gorlier, President and CEO – Mopar Brand Service, Parts and Customer Care. "Jeep owners are passionate about their vehicles and Mopar, with Jeep Authentic Accessories and Jeep Performance Parts, offers a full-line of products for them to express this passion through customization, making sure there is no other vehicle like theirs on the road." The seven new concept vehicles built for Moab this year were created by a small team of dedicated, passionate engineers, designers and fabricators that have been customizing production vehicles since 2002, and have introduced more than 50 concept vehicles for the enthusiasts who attend the popular Easter Jeep Safari. A tribute to the classic 1970s era full-size Jeep Cherokee, this Wrangler-based concept vehicle evokes the west coast surfer lifestyle of sun and fun with a nod to nostalgic beach rides. Custom exterior design cues include a vintage Ocean Blue exterior color scheme with a white, French Bread roof; a custom modified razor grille that the original Wagoneer made famous; halogen headlamps; removable sides for an open-air feel and flexible hauling; chrome front and rear bumpers and classic, 17-inch slotted mag wheels for a true '70s vibe. Jeep designers developed the Hawaiian themed interior complete with Jeep-designed "Surfer" pink, blue and white flowered cloth and leather-trimmed seats; vintage-style surf stickers on the center console and door handles; a Rosewood front-passenger grab handle and tiki-style shifter handle; and Uconnect 8.4-inch touchscreen media center. The doors and windshield were chopped two inches and the Jeep Chief sports a selection of Jeep Performance Parts that include a two-inch lift kit with Fox shocks and front and rear Dana 44 axles with lockers, cold air intake and modified Rubicon rock rails. The Chief is powered by the 3.6-liter Pentastar V-6 engine mated to a six-speed manual transmission. The Jeep Staff Car was built as a salute to legendary Jeep military service vehicles. 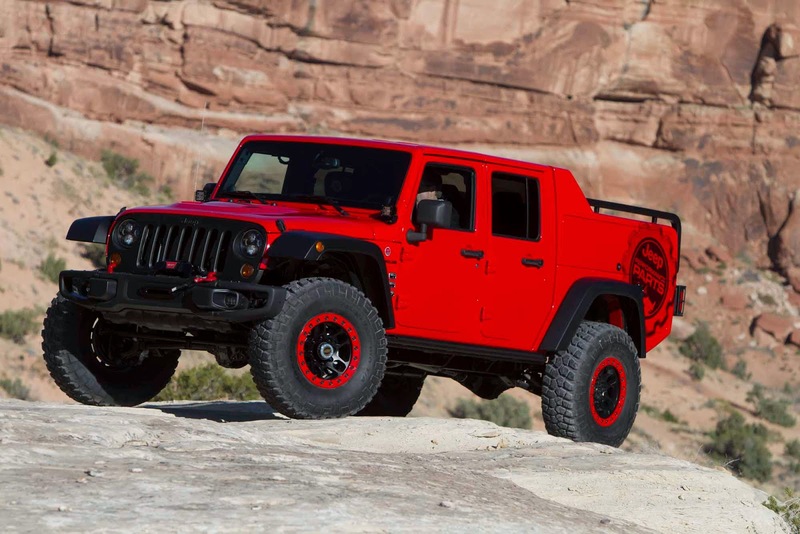 The open-air Wrangler 4-door-based concept vehicle highlights rugged functionality with heritage design cues. It looks historic and authentic, but is all new. The function over form of the original Jeep military service vehicles is evident in the Staff Car. Basic steel wheels, minimalist fender flares, "hungry horse" stretched canvas roof and bench seats all echo the original military Jeep vehicles. The exterior features a Sandstorm exterior color scheme that is carried throughout the vehicle including the wheels, frame and axles. The Jeep Staff Car has no B-pillar and no doors. Jeep designers incorporated military-style round headlamps, Jeep J8 front and rear bumpers, fender-mounted blackout lamp with guards and a rear-mount spare tire and vintage military gas can. The Jeep Staff Car sits on 16-inch wheels with 35-inch Firestone NDT military tires. The minimalist interior features low-backed bench seats in the first and second row, an integrated roll cage and a painted steel floor in place of carpet. A built-in cooler draws its inspiration from an old artillery box and accommodates 85 cans. The Jeep Staff Car is powered by the 3.6-liter Pentastar V-6 engine mated to a six-speed manual transmission. The Staff Car has a Jeep Performance Parts 2-inch lift kit with Fox shocks and front and rear Dana 44 axles. The Africa is the ultimate Jeep Wrangler for back-country and overland expeditions, with room for extra gear and auxiliary fuel tanks. The Wrangler 4-door-based vehicle sports a Desert Tan exterior paint, a high-clearance steel front bumper with winch, power step rock rails, power dome vented hood and an extended rear body and high-top roof. Powered by a 2.8-liter diesel engine mated to an automatic transmission, the Wrangler Africa also features fender-mounted auxiliary fuel cans. The Africa sports 17-inch body color steel wheels with 35-inch BF Goodrich Mud Terrain tires. The Jeep Wrangler Africa is outfitted with a two-inch lift kit with Fox shocks, sway bar links and front and rear Dana 44 axles from Jeep Performance Parts. The spare tire is underbody-mounted and the cargo area, inner roof and floor are finished in a durable spray-in truck bed coating. The Grand Cherokee-based Overlander concept vehicle represents the rough-and-tumble side of Grand Cherokee, a rugged and dependable vehicle customized for the enthusiast interested in overland expeditions where they travel and camp out of their vehicle. The Jeep Grand Cherokee Overlander sports Sage Green exterior paint. Custom features include a one-off front fascia, integrated front winch, tow hooks, larger wheel flares, SRT taillamps and hood, off-road rock rails, front and rear skid plates and 18-inch milled wheels with BF Goodrich All-terrain T/A tires. The powertrain is the 3.0-liter diesel V-6 engine mated to the eight-speed Torqueflight transmission. To top it off, the Grand Cherokee Overlander has a durable spray-in truck bed coating on the roof and a two-person hard-shell rooftop tent that is easily deployable. The newest addition to the Jeep lineup, the Jeep Renegade, is the basis for the Desert Hawk concept vehicle, and is equipped with a selection of Mopar and Jeep Performance Parts for the ultimate desert adventure. 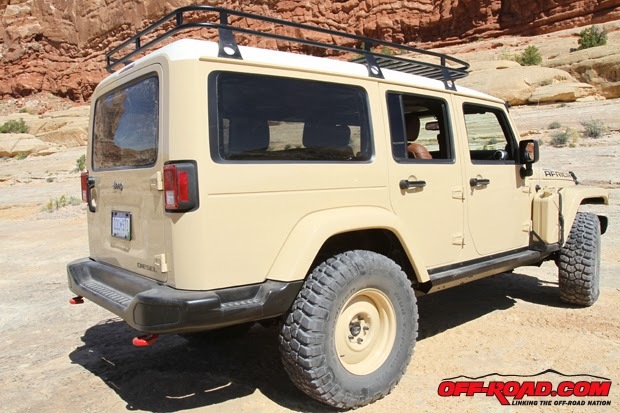 The Desert Tan exterior features a Jeep Performance Parts body decal, a topographical hood decal that depicts the Fins and Things Moab trail, off-road rock rails and a skid plate kit. Also featured are Mopar's trailer hitch receiver and roof rack. On the interior, the Renegade Desert Hawk has been outfitted with Mopar Katzkin seat covers, body color bezel accents and Mopar all-weather floor mats. The Renegade Desert Hawk is powered by the 2.4-liter Tigershark engine with MultiAir2 mated to a nine-speed automatic transmission with Jeep Active Drive Low. The Canyon Trail concept vehicle is developed from the Jeep Cherokee, Four Wheeler Magazine's "2015 Four Wheeler of the Year." In the spirit of that award, the Canyon Trail ups the Cherokee's best-in-segment capability with Mopar and Jeep Performance Parts specifically designed for even more off-road prowess. The Cherokee Canyon Trail's Desert Tan exterior paint is accented with a Satin Black hood that includes a topographical hood decal showcasing Hell's Revenge, a renowned off-road trail in Moab. The exterior also displays Jeep Performance Parts body decal, Satin Black roof accent colors and the 2015 "Four Wheeler of the Year" decal. The Canyon Trail interior features Mopar Katzkin leather seat covers and accent stitching, Jeep Performance Parts embroidered logo on the headrests, body color bezel accents, a cargo tray mat, Jeep Cargo Management System, Moab Off-road bag and all-weather floor mats. Off-road capability is turned up with the addition of JPP off-road rock rails, a two-piece fuel tank skid plate, two-piece underbody skid plate, oil pan and front suspension skid plates, as well as concept 17-inch painted wheels with BF Goodrich All Terrain T/A tires, which provide an additional one-half inch of lift. The Jeep Cherokee Canyon Trail is powered by the 2.4-liter Tigershark MultiAir2 I-4 engine mated to a nine-speed automatic transmission with Jeep Active Drive Lock, which includes low range and a locking rear differential. Based on the Jeep Wrangler, the Red Rock Responder is a support vehicle purpose-built to traverse the world's harshest terrain with premium off-road equipment to respond to any vehicle emergency with spare parts and tools stored in the built-in drawers and compartments of the cargo box. With a Vibrance Responder Red exterior paint, Jeep Performance Parts body decal, 10th Anniversary hood with hydraulic hood props, high-top fender flares and 17-inch beadlock wheels with body color beadlock ring, the Red Rock Responder stands out on any trail. In addition, the vehicle sports LED headlamps and foglamps, LED A-pillar and off-road lamps. Functional capability is increased with the addition of 37-inch BF Goodrich Mud Terrain T/A KM2 tires, four inches of JPP lift, Fox shocks, and front and rear Dana 60 axles with 5.38 gearing from Jeep Performance Parts. The vehicle also sports a cold-air intake, prototype off-road rock rails and a Warn winch. Red Rock Responder is also armed with Wrangler Rubicon 10th Anniversary Edition steel front and rear bumpers and high-top fenders that were previously concept parts but quickly became a production part due to popular demand. Side cargo boxes on each side of the vehicle hold a hi lift jack and accessories, fire extinguisher, road side accessory kit, first aid kit, Snap-on tool soft bags and recovery kit. It also stores an air hose and accessories, a dual compressor and air reservoir and has room for a cooler or a case of water. The interior stands out along with the exterior with embroidered black and red Mopar Katzkin leather seats, Jeep Performance Parts logo embroidered on the headrests, red accent bezels, grab handles and all-weather floor mats. The Jeep Wrangler Red Rock Responder is powered by the 3.6-liter Pentastar V-6 engine mated to an automatic transmission. 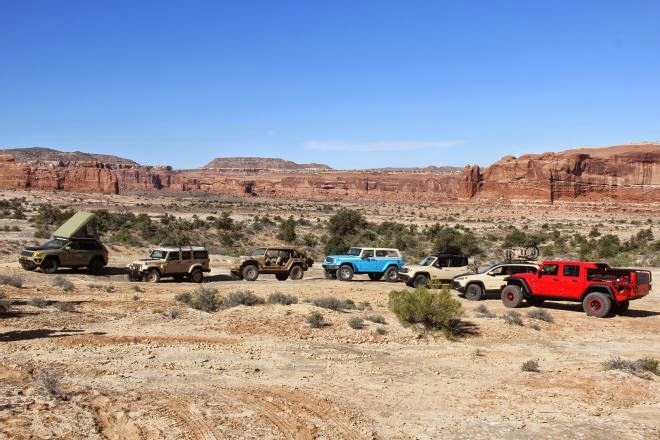 Easter Jeep Safari consists of trail rides, mostly day long trips, departing from Moab, Utah throughout the nine-day-long event. The Jeep Safari was started in 1967 by the Moab Chamber of Commerce as a one-day trail ride. Over the years, as participation grew, the Safari grew and expanded until it finally reached the current nine-day event. "Big Saturday" still remains the culmination of the event on the Saturday of Easter weekend. When do you think the Jeep Cherokee Chief will be available to purchase? Nevertheless, the Cherokee that you will have the ability to click here now have actually been customized to sport upgrades referring to off roadway experiences much like larger and harder tires, raised suspensions along with brushed guards. Did you know that you can generate cash by locking special pages of your blog or website? All you need to do is open an account on AdscendMedia and embed their Content Locking plugin. Manali visit bundles accessible on these sites make all courses of action including sustenance, settlement and movement to guarantee that globetrotters can have a significant get-away. Yes. It is really effective that people checking everything before a trip so that he or she might not face any critical crisis during that time. There are other free car repair manuals tips and suggestions available in Manuals.com website. Bannerizer made it easy for you to promote ClickBank products using banners, simply visit Bannerizer, and get the banner codes for your picked ClickBank products or use the Universal ClickBank Banner Rotator Tool to promote all of the available ClickBank products.